Indigo, spices, muslin and ivory – these were the items of luxury exported from India in the ancient times. Considered a noble craft, ivory carving created many a masterpiece in exquisite sculptures and artifacts. 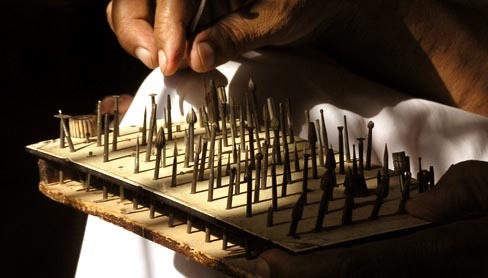 Ivory was used in palace decorations, “khadaun” or sandals used by Brahmins and religious figures and until a few decades back, for piano keys and chess pieces.Poaching and the dwindling numbers of Indian and African elephants resulted in a ban on ivory in 1989. 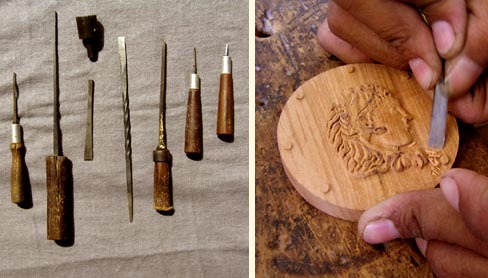 Carvers then started working on sandalwood, for it is easy to carve and has a beautiful fragrance. 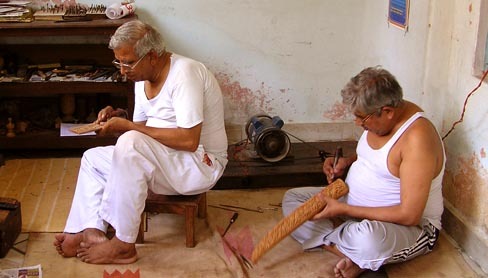 The community of carvers is however, still known as “Hast daant waale” or ivory carvers. 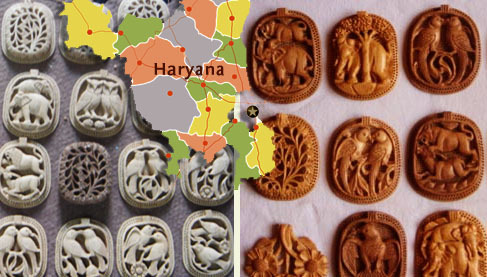 In the town of Bahadurgarh, halfway between Delhi and Rohtak in Haryana, there is a community of ivory carvers who now practice their craft on wood. The ‘Bondwals’ have been in this profession for over a hundred years and seven generations. In a joint family system, children have been learning the skill without any formal training, by watching their elders work.The craftsmen create decorative artifacts, jewellery and utility products like lamps, boxes, photo frames and pen stands out of finely carved wood. They purchase sandalwood from Delhi and a less expensive Kadam wood from Jind, further North from Rohtak. 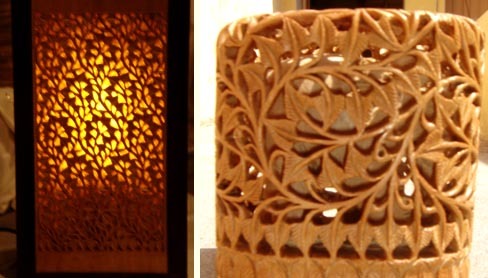 Sandalwood is softer to work on and hence, requires slightly blunt tools as against sharper ones for the Kadam wood.There is always the question of modernizing craft techniques and applications but not at the cost of losing the traditional skills and aesthetic sensibilities. The wood carvers of Bahadurgarh achieved this fine balance when they realized that their skill is in precision carving and not manual labour. A breakthrough was accomplished when Mahavir Prasad Bonwal introduced a new power tool in this field – the dental hand-piece, also known as Dentist’s drill. Dentists use a setup in which a hand held device runs on power to work on the intricacies of a patient’s teeth. It has various types of tips to perform the tasks of cleaning, whitening, watering, scrubbing etc.With clever ingenuity, the craftsmen started using the same apparatus, with a customized set of heads attached to it. This tool has greatly increased their productivity while making the carving process easier. Craftsmen begin by cutting the pieces of wood into uniform blocks with a hack saw. Then they make a drawing of the motif to be carved on the piece and start chiseling out the material using the dentist’s drill. Different kinds of heads are used for different tasks, and some of the tools’ heads are so fine that they can reach inside extremely small grooves.With an ‘undercut technique’, they carve exceptionally intricate objects enclosed within a carved shell. This gives a stunning ‘jali’ like appearance to the sculpture. 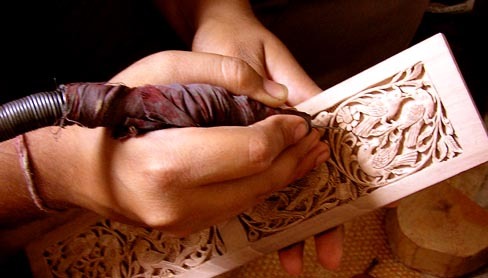 After carving out the motifs, the piece is buffed on a machine which has fibres that rotate and polish the wood, to give a smooth finish. Sometimes the piece is also varnished, if required.Every motif has a story to tell. 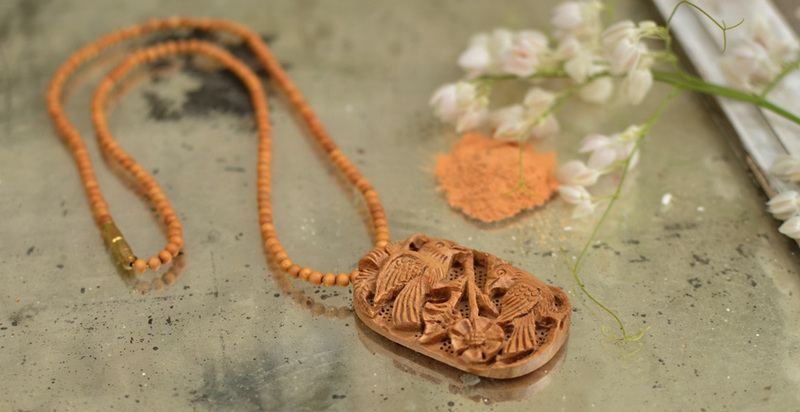 Themes from Panchatantra, predator-and-prey, flowers, animals and birds dominate the designs, with almost lifelike images emerging from the grains of fragrant wood. In one such piece, herbivore birds are shown together, avoiding depictions of predators, to show peace and harmony; such is the amount of detail pervading through each process from conceptualization to execution. Having given a new dimension to this craft and numerous awards received by his family, Mahavir Prasad dreams of a museum and school where this skill would be passed on to students irrespective of cast, creed or class. Truly, a marriage of technological advancement and traditional craftsmanship like this, can take this art to new horizons. Note As each piece in this category is handmade and unique, expect some variation from shown design. Indigo, spices, muslin and ivory – these were the items of luxury exported from India in the ancient..